•	Clearly articulated, Bureau-wide fundamental science practices. •	A shared understanding at all levels of the organization that the health and future of the USGS depend on following these practices. •	The investment of budget, time, and people to ensure that the USGS reputation and high-quality standards are maintained. The USGS Fundamental Science Practices (FSP) encompass all elements of research investigations, including data collection, experimentation, analysis, writing results, peer review, management review, and Bureau approval and publication of information products. The focus of FSP is on how science is carried out and how products are produced and disseminated. FSP is not designed to address the question of what work the USGS should do; that is addressed in USGS science planning handbooks and other documents. Building from longstanding existing USGS policies and the ELT concept document, in May 2006, FSP policies were developed with input from all parts of the organization and were subsequently incorporated into the Bureau's Survey Manual. In developing an implementation plan for FSP policy, the intent was to recognize and incorporate the best of USGS current practices to obtain the optimum overall program for our science. 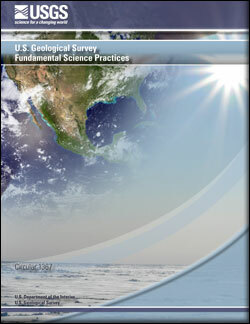 In January 2009, the USGS moved to full implementation of FSP. The FSP Advisory Committee (FSPAC) was formed to serve as the Bureau's working and standing committee to ensure the objectivity and quality of the Bureau's science information products and to provide support for the full implementation of FSP. Fundamental Science Practices Advisory Committee, 2011, U.S. Geological Survey Fundamental Science Practices: U.S. Geological Survey Circular 1367, 8 p.